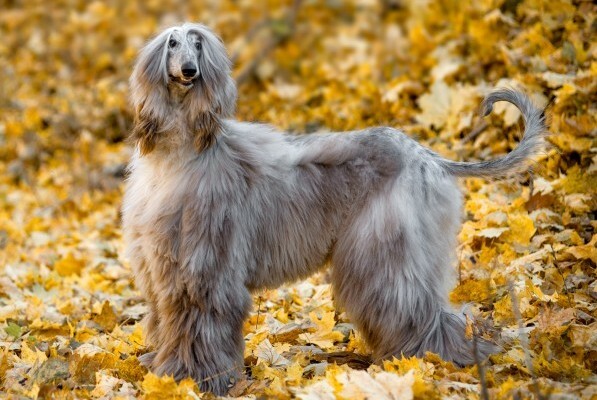 Afghan Hounds have to make our dogs with long ears list! Photography by Olga_i / Shutterstock. We’re sighthounds, developed in Afghanistan from ancient Egyptian lines to hunt large game across deserts and mountains. Although my magnificent coat is glamorous, it’s also functional, protecting me in weather extremes. My pendant ears are long and covered with silky hair. The leather (lobe) of my ear reaches nearly to the end of my nose. Regular weekly ear cleaning keeps my ears healthy, and wards off infection. If my ears bother me, you’ll likely notice me scratching them or rubbing my head. And, of course, if my ears show redness or discharge, let’s call my veterinarian. Chasing rabbits is fun. Ear discomfort isn’t! 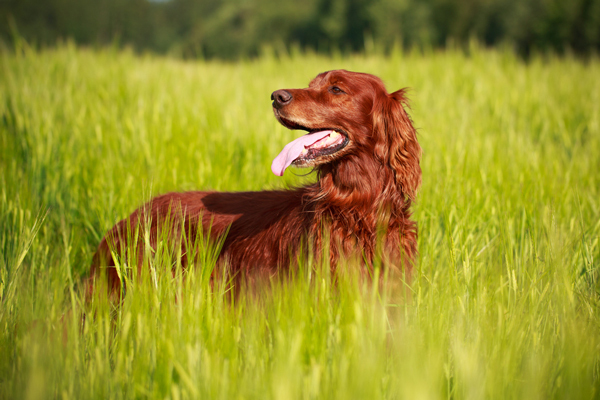 Irish Setters have vivid red coats — and ears! Photography by DragoNika / Shutterstock. I’m an active, aristocratic dog with long ears. Bred in Ireland as a tireless bird dog, I’m distinguished for my energy and enthusiasm. I blend creativity (and a trace of humor!) with vigor in field work and play. I’m also celebrated for my vivid red coat — many consider me the most beautiful of all dog breeds! My long, luxurious ears are set well back and low, not above my eye level. As my Afghan cousin mentioned, periodic inspection of our ears is especially important. Long-hanging ears tend to collect debris. The ear flaps also hinder circulation of air around my ear canal and trap moisture and dirt. Grooming my stunning coat will be a joy, but please remember to check my ears, too. 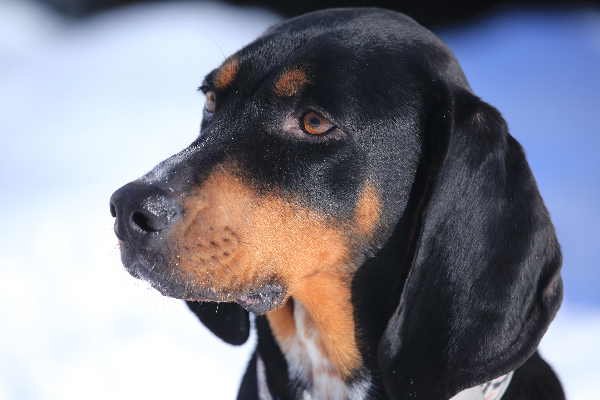 The Black and Tan Coonhound uses his long ears to help gather scents. Photography ©aMikeK | iStock / Getty Images Plus. I’m an All-American trail and tree scent hound, bred to stay on track regardless of conditions or rough terrain. Possums and raccoons are no match for my astonishingly good nose. My ears are low set and well back, dangling in graceful, velvety folds that give me a regal appearance. But my ears have more than one job. Hanging low, they gather in scents around my face, facilitating my tracking work. When they flap, they stir up the scent nicely for me. 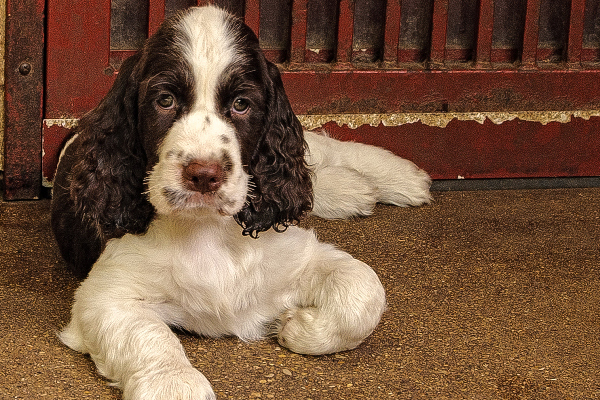 A roundup of dogs with long ears can’t leave out the English Springer Spaniel. Photography courtesy Melody Carranza. We’re popular for our friendliness, sweet expressiveness and athleticism. Developed by hunters in 19th-century England, we flushed and sprang birds from brush. My outer coat is either wavy or flat, and my undercoat is short, soft and thick. My ears are long and fairly wide. They hang close to my cheeks, with my lobes reaching the tip of my nose. 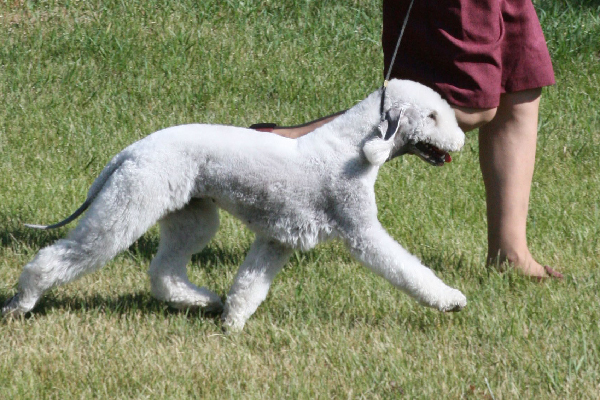 The Bedlington Terrier has long, triangular ears. Photography courtesy Diane Stille and the Bedlington Terrier Club of America, www.bedlingtonamerica.com. Originating in England, I gained popularity with gypsies, miners, poachers, gentry and sports enthusiasts alike. My ancestors’ lively temperaments and abilities allowed them to hunt rats, help poachers find game, and still have get-up-and-go for a race. I may resemble a lamb, but I’m a tough and tenacious hunter. My curly coat doesn’t shed much but does require regular trimming. My triangular ears, set low and hanging, reach the corners of my mouth. And my ears are velvety in texture, covered with fine hair. Look for the exquisite silky tassel at my ear tip. Tell us: What dogs with long ears would you add to the list? Do you have a dog with long ears? What breed or breeds is she? Thumbnail: Photography courtesy Melody Carranza. The post Let’s Meet 5 Dogs With Long Ears appeared first on Dogster.